Two weeks ago, after my students read Roy Peter Clark’s essay “I Won’t Use Writing as Punishment, I Won’t . . . ,” I asked them to compose responses to his claim that “writing as punishment is still with us” (4). I admit I doubted its relevance; Clark wrote the essay years ago, “more than 20,” he observes in the author’s note in our textbook, adding that he wishes “it was too old-fashioned or obsolete to reprint” (4). Maybe Clark’s essay was too old-fashioned or obsolete, I thought. I certainly didn’t expect the majority of my students to recount stories of writing as punishment. But they did. Most had their own stories; others recalled instances of classmates forced to put pen to paper in detention hall. I suppose, at least, that writing those letters of apology proved more instructive than writing one-hundred times, “I will not dis’ the teacher.” Still, the act of copying a sentence, not to present as your own–I would hardly advocate plagiarism—but to recreate its rhythm with your own hand can be a vital exercise. (That’s one reason I require students to write quotations in their journals, and I do in mine.) But if students have copied sentences as punishment, it may be hard for them to see the act of transcription as anything other than punishment. And writing their own words may seem punitive, too, if they’ve been sentenced to write letters and essays in the service of explanations and apologies. My students’ responses to Clark’s essay reveal that basically every form of writing that I require of them is one that they’ve written or witnessed other students write as a form of punishment. It shouldn’t surprise me that the problem remains prevalent, but it does because it’s clearly so wrong-headed. Just how wrong-headed, Clark showed more than twenty years ago when he first asked readers to imagine ourselves telling a child that because he’s been bad, he has to draw a picture or play the piano. Of course we don’t punish children with art or music, but teachers continue to punish students with writing and then lament the fact that they don’t like to write or that they don’t write well. That said, memories of punishment aren’t the only obstacle, or even the main one, for us–yes, “us,” I write as I struggle to finish this paragraph. Simply put, writing is hard. And now in the digital age, the difficulty of developing our ideas grows as our writing shrinks to fwr ltrs & wrds. Every year as I prepare to teach a new group of freshmen, or first-year students as they’re now called, I ask myself how I can make their first college writing class seem like more of a first rather than more of the same. This year one of my answers is the two books that I chose—ones that I’ve never used before—which approach writing in vastly different ways. The book that includes Clark’s essay addresses social and cultural aspects of writing. 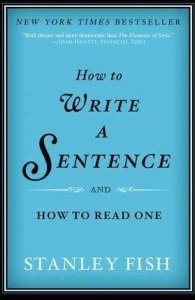 The other book, Stanley Fish’s How to Write a Sentence, as its title tells us, focuses on technique. I’ve also changed the daily journal assignment. Along with writing a quotation from their reading, they write one from something they weren’t required to read. It may seem like more punishment to them, and yes, I’m aware of the irony of requiring them to write lines from something they read for pleasure. But I want to convey to them the importance of reading for themselves by placing a value on it, giving it a place in their journals and in class discussion. And I also want to instill the importance of writing that isn’t evaluated, which I do through private freewriting in class and through letter writing. For their monthly letter-writing assignment, students submit a letter mail-ready: stamped and addressed in a sealed envelope. I don’t read the letters because I’m not evaluating them; I’m crediting students with the act of writing, which may seem like even more punishment. By approaching my teaching as I approach my writing—as a work in progress, subject to revision—my own ideas about how to teach writing continue to evolve. Attitudes developed over the years aren’t likely to transform over the course of one semester. But they can change. And writing about our attitudes toward reading and writing—as I have here, and my students will in their first papers—offers a place to start. Clark, Roy Peter. “I Won’t Use Writing as Punishment. I Won’t . . .” Essays on Writing. Ed. Lizbeth A. Bryant and Heather M. Clark. Boston: Longman, 2009. 4-10. Print. Isn’t it sad that teachers aren’t more inspired. Wish they could develop challenging writing activities for detention hall. I only remember a little bit of “I will not throw my pencil” in lower school. Later it was stuff like conjugating Latin verbs. I didn’t have detention, but I heard stories. Writing prompts could end up being worthwhile, but they might turn out to be fun for students… and that certainly wouldn’t do! Thanks for your article. Thought provoking. I’d forgotten all about writing punishments. Amazing they’re still being used. Thanks, Lenore. I’m amazed as well. I stumbled across this while looking for Clark’s essay. I’m one of the editors of the book (Heather Clark, no relation). I just wanted to say, that although this was quite a few years ago, I’m so glad you found a piece of our book something to open up conversation with your students. It’s exactly what we wanted it to do. Wishing you well. Thanks, Heather! 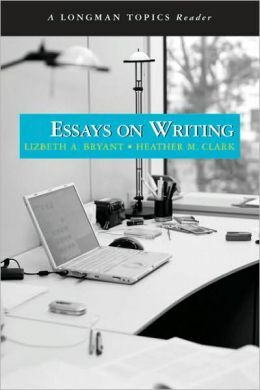 The readings that you and Lizbeth Bryant collected in Essays on Writing were the sources of many classroom conversations–and springboards for many pieces of writing as well.